Hello friends! Forgive my absence? I promise it was for a good reason! We bought a house! We are so thrilled and cannot wait to move in! We close on September 20 and the big moving day is September 27. We spent most of the summer house hunting, which was fun but also had bumps in the road. First it was a bit of a process getting our financing in order, then we couldn't really find a house that suited both our needs, then we found literally my *dream* home and lost it to another bidder. And finally we ended up with the house we are under contract on now. It was a bit of a compromise for me as it is out of my preferred area but I'm slowly coming to terms with the idea of leaving my beloved neighborhood. The house we ended up with is so much bang for our buck and far more than we could have afforded in my preferred location. 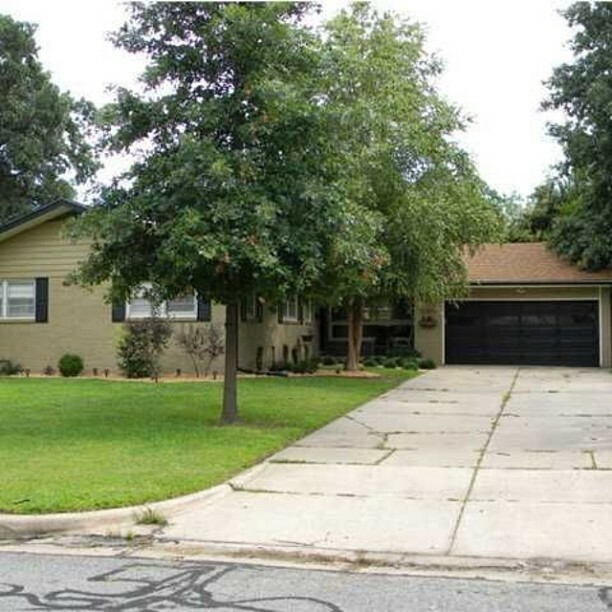 It has three separate living rooms, four bedrooms, 2.5 baths, a very large updated kitchen, and 2,400 square feet. I am so excited that we get to have that much space after being in our teeny apartment for so long! I don't even know what we'll do with all of it! You better believe my mind has been swimming with tons and tons of design ideas. I've gotten to do a pretty decent amount of purchasing, and will have more to do once we actually move in, so that has been so much fun. You definitely need a lot more furniture going from 800 square feet to 2,400! 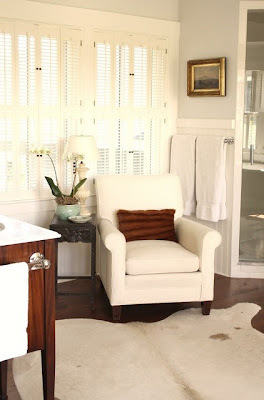 The house has hardwood floors throughout, huge windows and white trim, so the "bones" are just my style. We plan to paint every room in the house before we move in, but luckily don't have to do any of the hard stuff like cabinets or trim work - that's already done. I thought I would show you some of my design plans for the main living space. It is an absolutely huge room that is shared with the formal dining (one big space) so there is lots to do in here. One wall is a giant, nearly floor-to-ceiling window that lets in lots of great light. 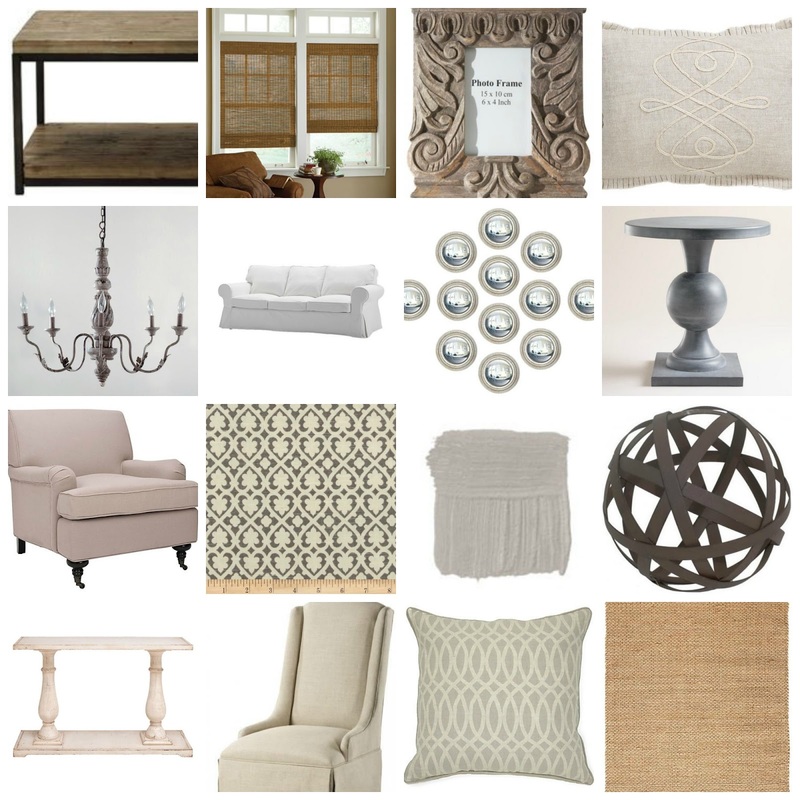 I'm hoping to paint the room a French gray so I can use a base of whites and add in taupes, linens and grays (I didn't want to use only taupe or only gray so I think it will be a nice mix). Above you can see a few of the pieces I'm going for. A few I have purchased and some I'm waiting on or might ask for as Christmas gifts. We are purchasing a new couch - the Ikea Ektorp - for this room. At first I was planning to splurge and buy my dream couch as an investment "forever" piece (the Willow sofa by Crate and Barrel), but even though we have a fairly decent sized furniture budget, it all adds up fast. So we've decided to go with the much more economical Ektorp for now. I knew I wanted white with a slipcover so it would be washable, and as everyone says, this is definitely the most affordable. I also purchased the bricklayer coffee table, zinc side table, baluster console, jute rug and linen parsons chair pictured above. Since the living and dining are all one space, I'm hoping the console will break up the room a bit (placed behind the couch). The pair of parsons chairs will go on either end of the dining table, which I've also already purchased. I scored a French Provencial table with six French cane back chairs for $175 on Craigslist, which I plan to paint white once we move in. I think the parsons chairs will soften it a bit and I plan to hang the French gray chandelier from World Market above it. I've also picked paint colors for the rest of the house as several friends and family are graciously willing to help us paint the week before we move in. 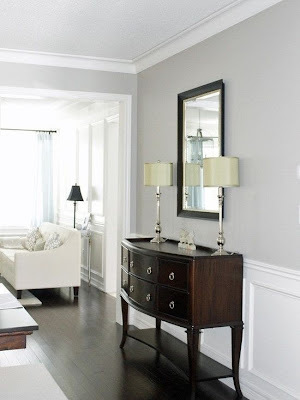 The living/dining paint color will be Silver Fox by Benjamin Moore. 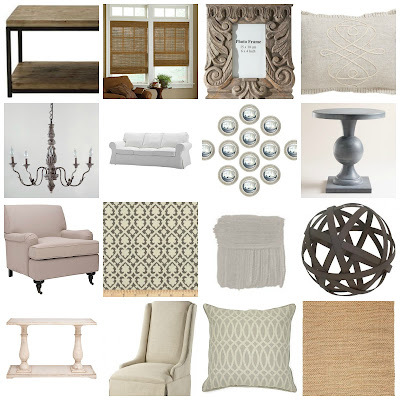 I think this is the perfect shade of gray with taupe mixed in. Although now I'm waffling between French gray and simple white! I think I'll start with Silver Fox and see how it is and if I'm just craving a completely airy space I can always repaint down the road. 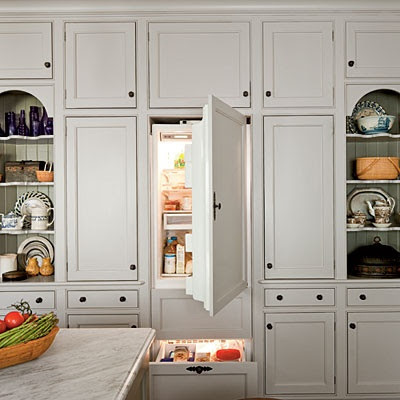 The kitchen and hearth room off the kitchen will be Revere Pewter by Benjamin Moore. 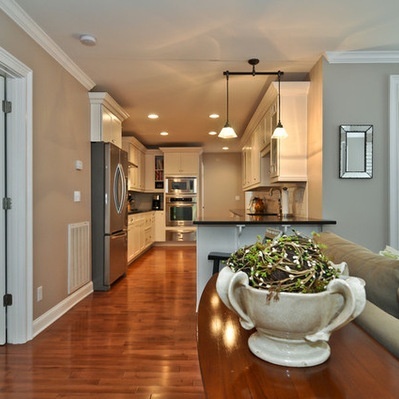 I think it's the perfect clean, sophisticated gray for a kitchen. 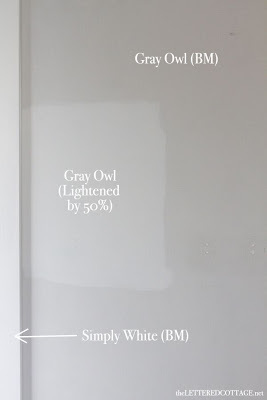 Our bedroom will be Gray Owl by Benjamin Moore (not lightened). I've wanted gray bedroom walls since we moved into this house and I'm excited to finally see it come together! And the guest bath, our master bath and the long hallway connecting all the bedrooms will be the softest of grays - Horizon by Benjamin Moore. I think it will make them feel open and airy as they are all fairly small spaces. I'm still debating what the other three bedrooms will be - one of the colors we're already using but I'm not sure which in each room. One room will be an office, the other a guest room, and the third I'm considering making into a dressing/powder room but haven't totally decided on that yet. The spare bedrooms are definitely last on my list at this point, since I'll want to get the common areas done first. I can't tell you how excited I am to move in and get started on everything! It will also be a big change in lifestyle for Matt and I to have so much space! We are looking forward to have a couch to sit on and watch TV together - nope, we have not had that during our entire two years of marriage! We are thrilled to have so much space to spread out and grow into. Matt even gets his own rec room, which he has already outfitted with a giant new TV and pool table : ) Both of us are so excited to have guests and parties in the new space, something we've never really been able to do here. I'll keep you posted as the moving progresses, though you'll probably catch me much more often on Instagram and Pinterest. If anyone has any moving, painting or homeowner tips, you better believe I want to hear them!